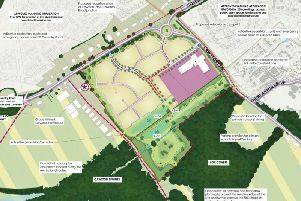 Harborough District Council Planners last night (Thurs) gave the go-ahead to a massive new warehouse scheme at Magna Park, near Lutterworth, which could bring 1,200 new jobs. Their approval for the warehouse, which would be a million square feet in size, came despite fierce and well-organised opposition from local people, including more than 900 objections to the council. But in the end, only three councillors on the planning committee voted against the warehouse plan. After the meeting, one of the protest co-ordinators, Maggie Pankhurst of the ‘Magna Park Is Big Enough’ campaign said: “I’m incredibly disappointed. More than 350 protestors filled the hall of Lutterworth High School for the four-hour planning meeting. A succession of local people spoke against the warehouse plan, which is for distribution and express mail giant DHL, saying it would bring more traffic, more pollution and potentially more accidents to the area. They said it would wipe out valuable farming land, and damage local wildlife and a local heritage site. They also pointed out that Lutterworth, with almost full employment, did not even need the extra jobs the warehouse would bring. But a comfortable majority of the Planning Committee agreed with the council’s officers’ recommendation to approve the warehouse plan. They said the size of the warehouse - which would be almost one-and-a-half kilometres in circumference and 23 metres high - would not significantly impact on local properties. Gwyn Stubbings, the planning director of IDI Gazeley which owns Magna Park, had told the meeting that demand for space at Magna Park remained high. But he said companies including Costco and Primark had left the park because the existing Magna Park could not accommodate their planned expansion. At the end of the meeting, disgruntled protestors shouted “disgrace”, “shame on you” and “this isn’t democracy”.